@iChibi Not to mention that the playable and non-playable versions use separate models. That shouldn't be an issue at all. 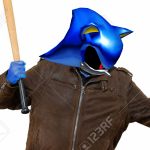 @THiN CRUST They may have reused this model from SA2 and/or SA2B, since both were released before SADX. Looks more like the Metal Sonic from Adventure 2. Er, whoops. Kinda got the two locations mixed up. @iChibi: I think there was a mistake, thinking this was the one that appeared in the Egg Carrier instead. Fixed it, though. Why is this non-playable? You can play as Metal Sonic in trial mode?? Do the playable Metal Sonic and the prop Metal Sonic from Eggman's base use the same model? EDIT: Aaand I went to the game's page and answered my own question.